At Visionclean we recognise the need for high standards of cleaning giving perfect presentation, which makes a significant difference to your customers perception of your business and brand. At the same time we also understand the importance of cleaning to the higher standards for the health of your staff and the benefits this can bring to the operation costs and profitability of your business with lower rates of absence. We work with Car Dealers/ Motorbikes/Cycle and other similar facilities. Our experience and commitment to our customers means that we deliver the highest quality of cleaning services whether customers choose our Standard Cleaning Service or opt for our environmental EcoClean service. In both instances we believe that the cleaning methods and audit systems we have introduced will more than satisfy our customers expectations. Not only do we ensure that your public, receptions and office areas present the highest possible standards, but we have developed our services to ensure the communal areas used by staff, such as kitchens, eating areas and toilet facilities are maintained to the highest standard possible. The Visionclean team also advise clients on methods of hygiene to improve areas of significantly high risk of bacteria, to endeavour to improve standards that can impact health such as air quality. Studies in the USA have connected the standard of cleaning in the key staff workplace areas with levels of absence. It is our belief that using our managed services can work to improve this and therefore potentially impact your overall profitability. 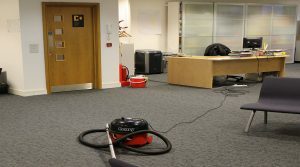 We have created site specific staff training and processes designed for our staff to ensure we manage cleaning customers offices to the high standards, but with minimal disruption even when the services are required during customers working hours. We are happy to provide in opening hours cleaning services if your business requires that. The information we have provided below gives an indication of why we believe our approach to cleaning in your business is so critical and why we have gone further than most cleaning service providers, in the level of our research to provide our own unique approach to cleaning services. See if we can show you how Eco can be better and cost effective. It cost nothing to try and you have everything to gain. Our service uses the best available Eco cleaning products, together with environmentally friendly equipment and very importantly cleaning methods most suitable to maintaining Eco standards. Taking our Eco Clean Service delivers practices able to bring the highest standards and a safe working environment for both employees and visitors alike, while never losing sight of the need for extremely high visual standards of cleanliness too. We believe the benefits to our customers are huge and will be a convincing argument for businesses to take up our Eco Challenge in 2016.